Drop what you’re doing, kid; we’re going to the bait shop to pick up camouflage hip waders, rods, reels and tackle, pheasant feathers, mule-hair, two cans of pheromones, frog eggs, and other slimy supplies for tying flies. We’ll head into the basement for the rest of winter to get ready. This spring, we’ll drive 10 hours north, and we’ll wade into an icy stream in the middle of the night in a dark forest on the off chance that we might catch a fish that we’ll have to throw back. It’ll be great! I used to do it with Grandpa when I was a kid. Just you and me. What do you say? Oh, and let’s rent A River Runs Through It tonight. You don’t have any plans, right? I’m guessing she might sidebar to text a friend about her nutcase dad (or mom) and then tell you, in so many words, to pound sand. Well, to be fair, that’s what my daughter would do. I can’t speak for yours. But who is to blame her? She’s got serious stuff going on at 17; that boyfriend, her Irish dance career (no matter that she’s not Irish), studying for the SATs, trying out for American Idol. And there is a DJ at school tonight. Busy. Sorry. Your family fly fishing aspirations? Put them back on the shelf where they belong. You never should’ve brought it up. I’ve been lucky to spend the better part of the last two years traveling and listening to sailors share their ideas about Saving Sailing. I can report that the situation is about the same everywhere. Most American sailors are boomers and they sail with other boomers. Every town has a decent junior program with many enthused kids in it. Some high school and college kids and young adults sail, but when they marry and have their own kids, they usually quit. Invariably, in these Saving Sailing discussions, there will be a college kid or a young couple that aspires to sail long into the future, and who is genuinely concerned that their own love of sailing will fall victim to parenthood, when and if that happens. They’re there to ask how to prevent it. I respond with the hypothetical tale of almost fly-fishing with a teen daughter. And then I ask what would’ve happened if they had not put fishing (or sailing) on the back-burner between early and late parenthood? 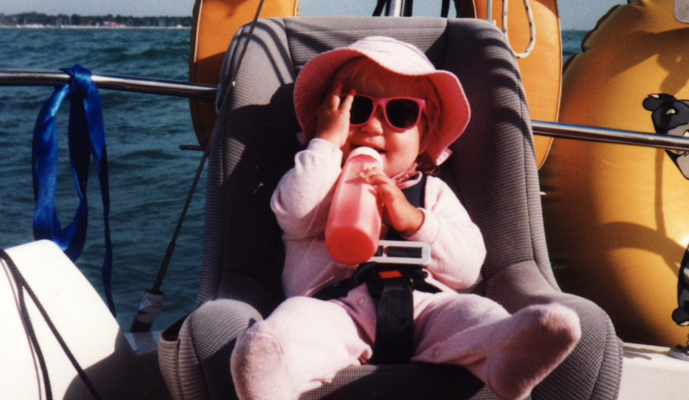 What if the daughter had been fishing (or sailing) since she was born? What if she wore a lifejacket and learned to swim while learning to fish (or sail)? Think she would be any less of a student having spent years learning about weather, wind, energy and water? Think she would be any less attractive as a candidate for a college scholarship as a skilled and savvy outdoors-woman? Think she’d tell you to pound sand if you asked her to go with you on any given Saturday, after 17 years of fishing (or sailing)? Think she’d think you were a nutcase for having the idea in the first place? Of course fishing and sailing are not impossible with babies and toddlers. They never were. Parents can make provisions. They always have. A sailboat (or a fishing boat for that matter) can be outfitted with a car seat and the kids dressed in the right clothes and safety equipment and slathered with sunscreen. The format can be adjusted to accommodate the special needs of these tiny people. Grade schoolers might try as many things as they think might be interesting, but not if it gets in the way of fun outdoor family time. Given the chance to learn among adults, kids of any age will certainly learn special skills and lessons that can never be taught indoors or in packs of like-aged kids. Middle and high schoolers can focus just as well on something they like to do with mom or dad, as they do without. Perhaps most importantly, kids who are familiar with nature and who value intergenerational experiences are much less likely to develop video game or other media consumption habits. They’re aware of a far better alternative. Guiding these choices and creating these opportunities are among the central roles of the modern American parent. So the first step in finding time for family sailing is to never stop sailing in the first place. You are currently reading Hey Kid, Let’s Take Up Fishing at Saving Sailing.